Oh, Chickens, it is my favorite time of year. Artichokes are back. And this is an update of last year's post, with some important new info! I am also aware that this makes me an insane person. Right up until I have a dinner party for 12 24 and serve everyone artichokes on artichoke plates and then I am a GENIUS. Artichokes are magical to me. A large artichoke packs 9g of fiber, 5g of protein, no fat or cholesterol. It is only 17 grams of carbs, so very diabetic friendly, it counts as just one carb serving. It is high in Vitamin C and Magnesium, with some bonus Iron, Calcium, and B-12 hanging out in there. And best part? ONLY 75 calories for the whole thing! Okay, thats not the best best part. The bestest best part is that they are freaking delicious. I literally cannot get enough of them, and from mid-April thru June, Charming Suitor and I gorge guiltlessly on these beauties. Yes, this is for two people. I buy them 8 at a time. The first day I get them, I prep and steam them, and CS and I have two each for dinner. He will take one to work the next day for lunch, and I'll eat one at home for lunch. The other two are then available for a day or two for either lunches or snacking or to become an ingredient in something else. 8 artichokes last us about three to four days. And we do this routine once to twice a week until the season is over. And then we miss them until the following Spring. These are the weeks that prove your love for someone, because do not mistake me, this is a lot of fiber and vegetation to put through your system, and they will, without fail, make you spectacularly gassy. You might hypothetically blow the love of your life out of the bed. But they will forgive you because artichokes are so yummy that it will not matter that you both become walking dirty bombs for eight weeks a year. This is especially important these days, as we are both being very careful about eating healthy and losing weight, which includes logging everything we eat, and there is something magical about a food you absolutely love, which in many ways loves you back. 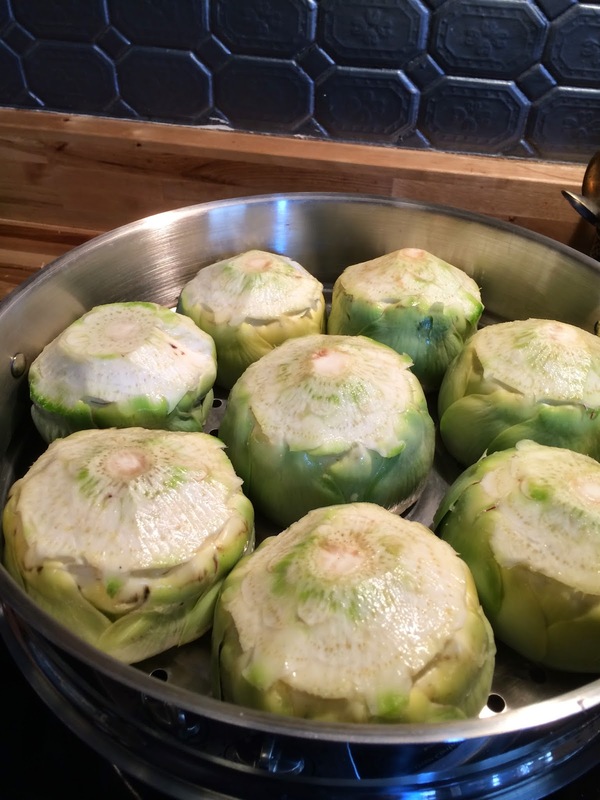 There are very few foods that fall into this category, so I give huge props to the ones that do...this time of year artichokes are actually a big part of helping us stay on our program and not feel deprived. For those of you who think artichokes are complicated, they are not. I've had a lot of practice, so I can break one down in about 45 seconds to a minute, but once you know the technique, you can knock it out fast yourself. Don't be scared of the artichoke! It will reward you. When buying them, look for ones that feel heavy for their size, have leaves that are nice and tight, and they should squeak a little when you squeeze them. First thing, have a large cutting board, a 6-8 inch serrated knife (essential...more on this in a minute) and a lemon, cut in half. Do not do this with a straight edge knife, you need the serration for grippiness. Trust me, you'd like to keep all of your fingers. This is a great time to use that sad little mangy lemon in the bottom of the fruit bowl. The artichokes won't care. Hold the artichoke on its side, and slice off the stem flush with the bottom of the artichoke to make it fairly flat. Let chefs peel and fuss over the stems, as CS says, the juice isn't worth the squeeze on that, go for fast and easy instead. Once the stem is removed, use the knife on a slight angle on the bottom, from the revealed center outward, to slice off the bottom outer leaves and reveal the heart. Go all the way around the bottom of the artichoke in this manner, it will take about 6 slices total to have the bottom totally peeled. Rub the cut side of half a lemon on the bottom. Then turn it back on its side and slice straight down about 2/3 up the side, removing all the spiny top parts of the leaves in one go. 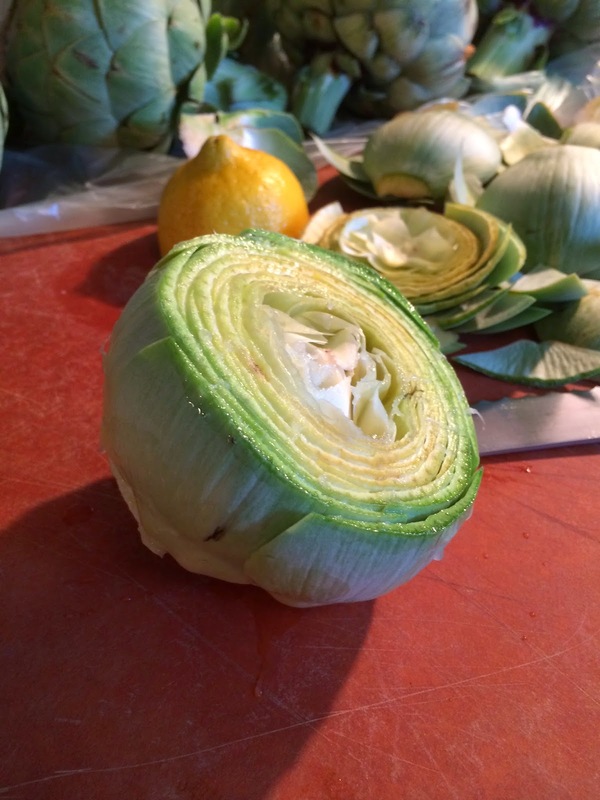 Rub the lemon on the cut ends of the leaves, and you will have a prepped artichoke! 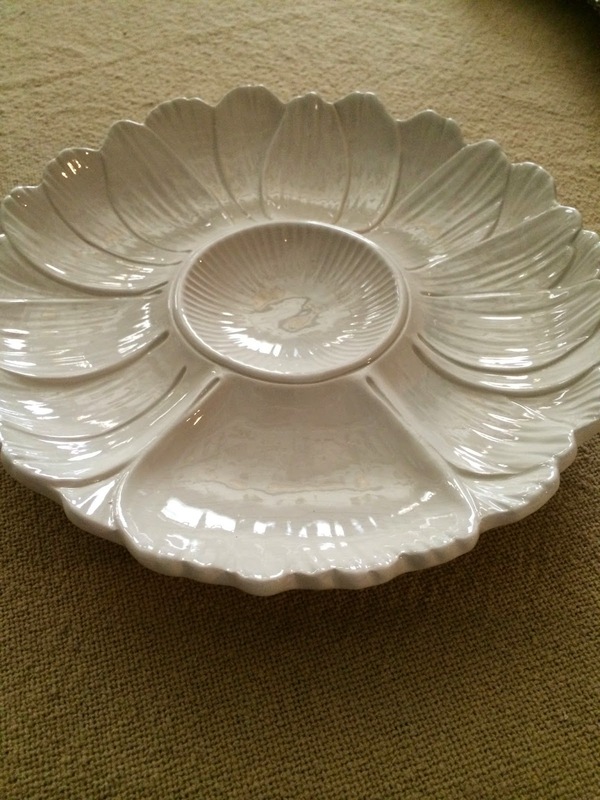 I use a large steamer, but you can use a steamer basket in a stockpot, or a steamer insert. 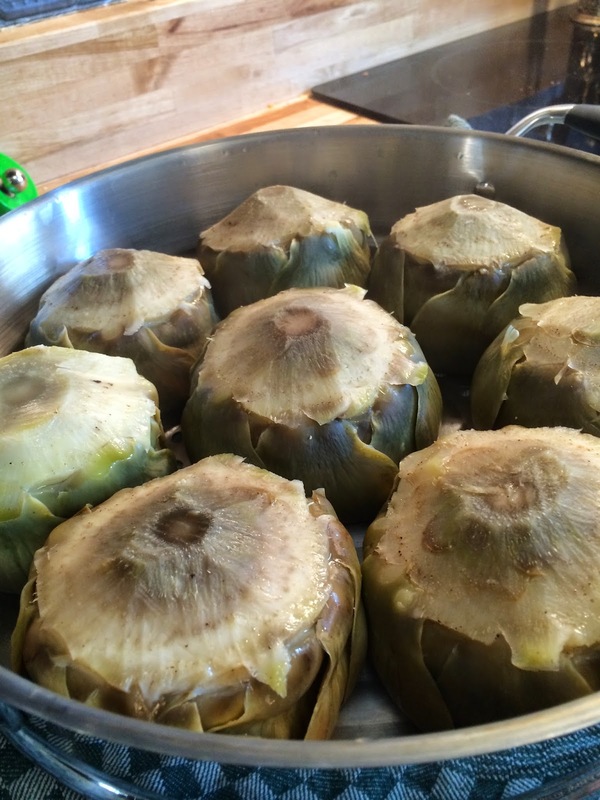 Place your artichokes bottoms up in your steamer, with about 2 inches of water in the pot. You don't want to boil them or let them touch the water, or the leaves will soak it up and get waterlogged. Cover and steam over high heat for about 35-40 minutes. I test by poking a fork into the bottom of one, it should go in and out smoothly. I don't use a knife to test things like artichokes or potatoes because my knives are super sharp and may slip right into something that is actually not quite done yet. Forks are a much better indicator. Aren't they just gorgeous? I take them off the heat and place them over a towel for about 15 minutes. Then I put the four we are having tonight on a plate with a piece of plastic wrap, they'll be terrific at room temp, and put the other four in the containers in the fridge for later indulging. I know many people swear by drawn butter for dipping. And you know your Polymath is a big fan of butter. Mo' butter, mo' better. Well, usually, I mean, not these day when it is a little bit of butter used judiciously where essential, those buttery calories do add up quickly! But even when I am on a full steam ahead butter festival, I just don't love it for my artichokes. Artichokes are buttery on their own, much like avocados. They want a little acid and a little salt to make them shine. 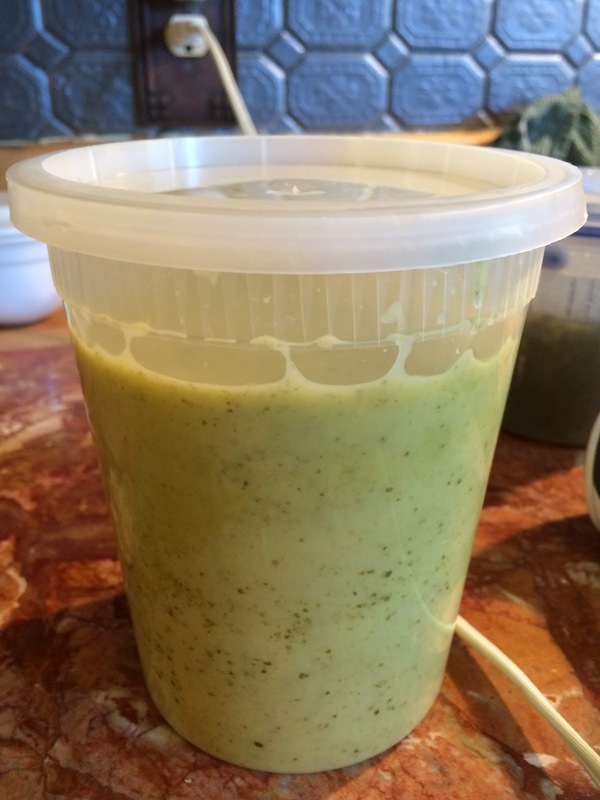 I make vats of a pungent thick vinaigrette that we use for dipping, (these days with about half the oil that I used to use, with no ill effect)! I use lemon juice, dijon mustard, shallot, capers, olive oil, salt and pepper to taste, maybe a pinch of sugar or a squirt of agave just to polish off the rough edges. I don't measure, I just go by eye. 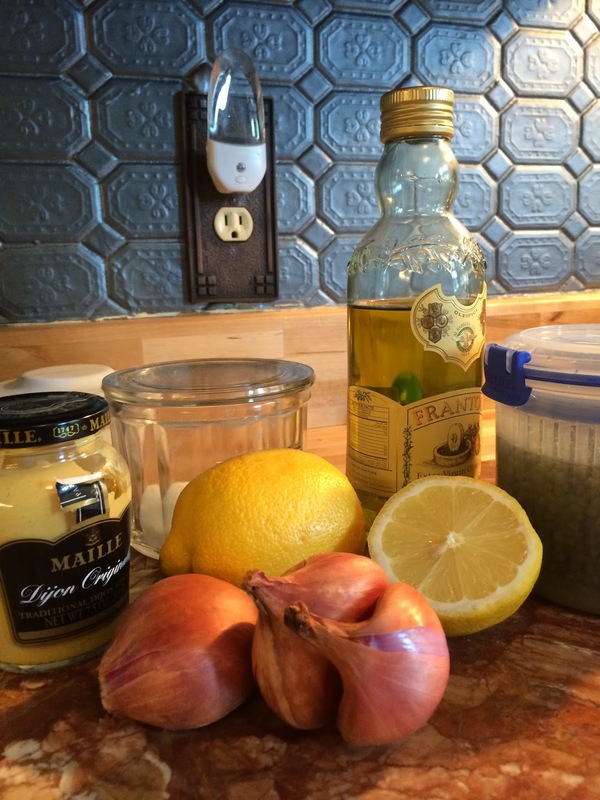 For the original sauce, since many of you are not restricting your eating: This is the juice of 1 1/2 lemons, 2 heaping spoons of capers, a large glug or two of dijon mustard, and one chopped up shallot. Then I pour in about twice as much oil as I have stuff in the bottom, and use my immersion blender to whizz it all up. Taste for seasoning, adjust as necessary. 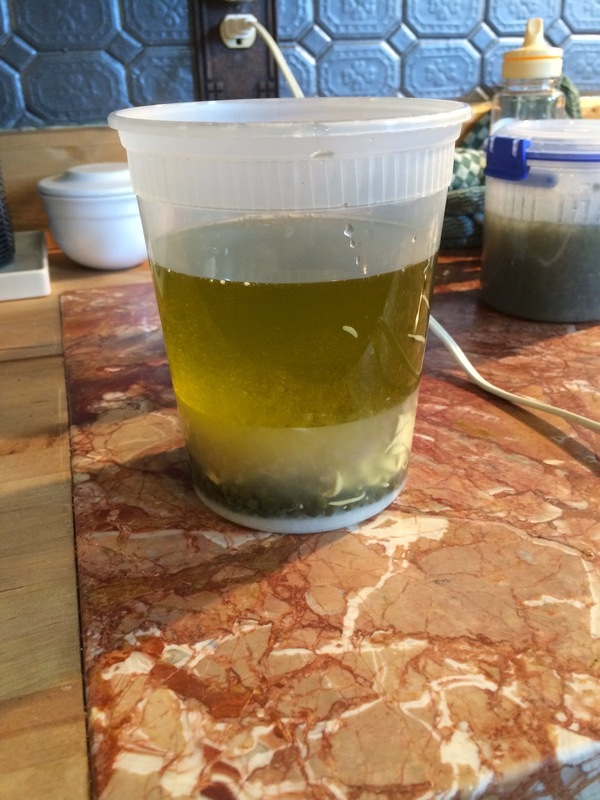 For a lighter version, I do about 1/2 c of water, 2 T of white wine vinegar and 1/2 c of oil instead of the straight oil, keeping the rest the same. I like this much more intense than I would make for salad dressing, you should do what you like. This is making a huge vat of it, because as I may have mentioned, we eat eleventy million artichokes a week, and this stuff lasts a couple of weeks in the fridge. You should feel free to make a rational amount if you choose. You don't need a lot, I only use about 1 tablespoon for a whole artichoke for dipping, (now have cut that down to about 1/2 T, again, still very enjoyable) you just want to gild the lily a bit. For me, the first artichokes of the season are the only thing that really means Spring, and after this winter? Having them back on the menu is amazing. Know what else is amazing? Finding a special tool for a favorite dish that makes it even easier to prepare. This is the new Wüstof 6" salad knife, which they sent me to test earlier this week. And yes, it is amazing for salad, which I can tell you because salads are a big part of our new eating habit! But as great as it is for that? It's a gamechanger for artichoke prep. The 6 inch length is perfect for even the most jumbo artichoke, and the razor sharp serrations grip even the wiggliest sphere. This thing has cut my prep time nearly in half! Thanks to the always amazing team at Wüstof for sending it, for any of my Chickens who are as into the art of the artichoke as I am, you are going to want to have this one in your arsenal for sure! What are the super seasonal things you wait all year for, and how do you prepare them? Extra points if they happen to be on the healthy end of the spectrum! I love artichokes too! My mom always made them stuffed with garlic and Parmesan cheese for Thanksgiving. We don't really buy the fresh ones anymore because they are sooooo expensive here and there are just way too many of us. But maybe I can take out a small loan and just get a few for my hubby and me.... I think you've inspired me. tomatoes. I eat them all summer. There is nothing in life finer than a Wonderbread, Duke's mayo, sliced beefsteak tomato, salt & pepper sandwhich. You can't get Wonderbread anymore...so you have to find the whitest, white bread with zero nutritional value to come close. These look yummy. I get the six packs at Trader Joe's, a different looking "looser" artichoke that I can stuff for my husband. Comfort food from his Italian grandmother I don't care for them but he loves them. Bread crumbs, parmesan, beaten eggs, salt, pepper, a little oregano - mixed and stuffed down into the leaves (parboil the chokes). Inevitably, in any Italian market during the right season, there will be little grandmotherly women peeling artichokes down to the heart and tossing into acidulated water. This is probably going to be sinful to admit aloud... I've never tried artichoke! Reading this post, now I feel like I'm missing out on the world's greatest thing. 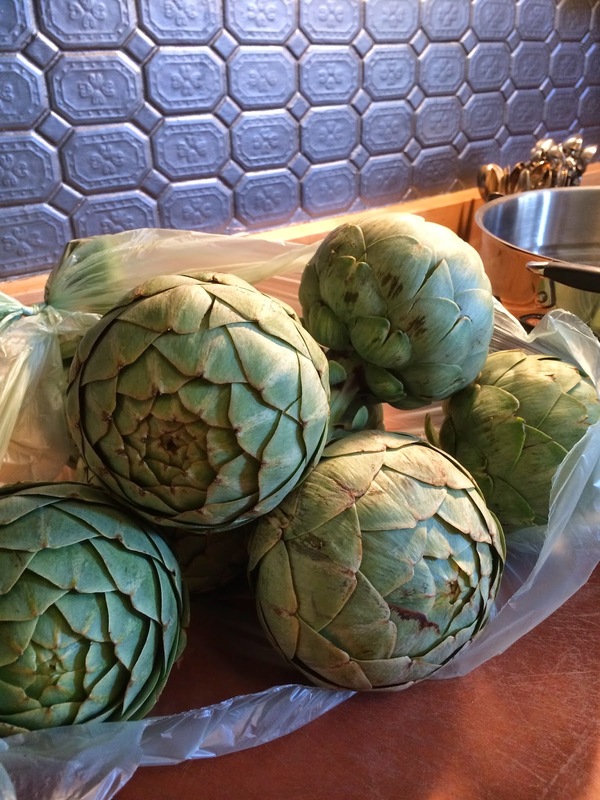 Hmm, this weekend - to artichoke or not? I, too, love artichokes. My dipping sauce of choice is mayo, mixed with enough red wine vinegar to make a dressing-like consistency. That's it. So tangy and creamy, my mouth is watering just thinking about it. Fresh fruit. Blackberries straight off the vine. I feel about fava beans the way you feel about artichokes. They are a tiny labor intensive, but once you get the groove, it's no problem. This year I've been eating them with zucchini noodles made with my spiral gadget, a touch of butter, coarse ground pepper and a sprinkle of parm. Joy! I'm such a Midwestern girl: corn on the cob. And like you, though butter is a GLORIOUS thing, I actually find it a bit redundant on a good ear of sweet corn. Since moving to Chicago, and experiencing the corn from the Latino food carts, my absolute favorite is corn on the cob with lime juice, a little salt, a little pepper, and a little cayenne pepper. Spicy perfection, and no butter needed!!! I fix my artichokes in the microwaver. Cut off most of the stem, and the top third with a serrated knife. Take scissors to cut off the pointy bits of the remaining leaves. Turn upside down in a large measuring cup that has a half inch or so of water, a splash of apple cider vinegar, and a couple of drops of olive oil. Cover with wax paper (the one thing I still use wax paper for!) and nuke/steam each one for 6-8 minutes. Scream "too hot! too hot!" for about 10 minutes while you eat the rest of dinner, then dip each leaf in a touch of mayo. When all the leaves are gone, fish out the choke with a grapefruit spoon before devouring the base. Will give your way a try! Anonymously Betty, because I can never get the ID feature to work.